Bit late getting this figured out this year, but I guess it’s still January. Similar to last year, here’s a quick bullet point list of stuff we managed to accomplish this year. Built a “chicken tractor” big enough for about 10-15 broilers. Raised and slaughtered 15 Freedom Ranger broilers. Overall it went okay, but still debating if we want to do this every year. Not including labor and equipment (2 big expenses), our cost per pound was in the low $4 range. Lost two more of our original hens. We still have “Faith” the barred rock remaining from the original Bristol 4. Got 6 day old Ancona ducklings and successfully raised them to adults. Three were male and three were female, so two of the boys were redundant and went to the freezer. Put automatic doors on both the chicken and duck coops. This has simplified care significantly as well as made it easier for us to leave the property in someone else’s hands for a few days. This was the first full growing season with the greenhouse and it made a significant difference in the size and quality of my starts. We bought very few starts from outside the property this year. 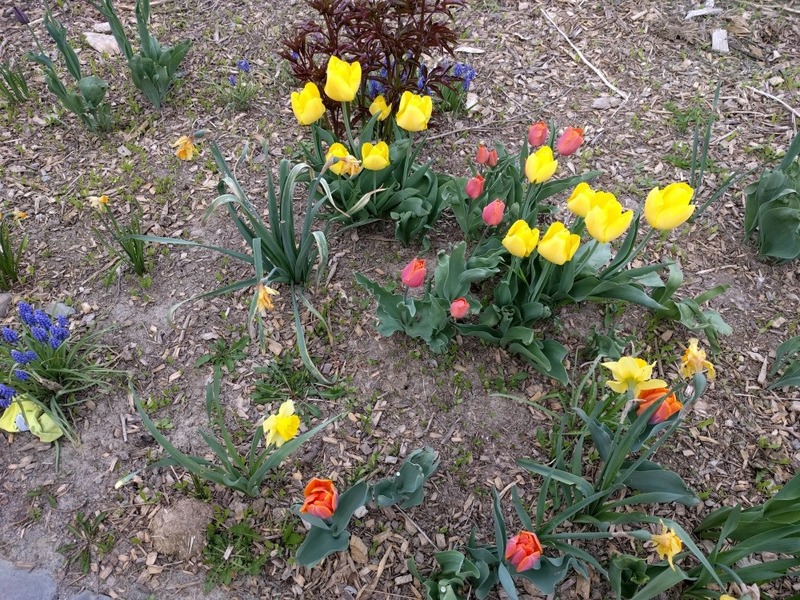 For the most part, an amazing gardening year. Super warm and sunny, which made for an abundance of tomatoes. We added more fruit trees, 6 more raspberry plants, 25 everbearing strawberry plants and another purple asparagus bed. The original raspberry plants from 2015 really came into their own this year for the most part. We got a great yield of berries. Brussel sprouts finally worked. 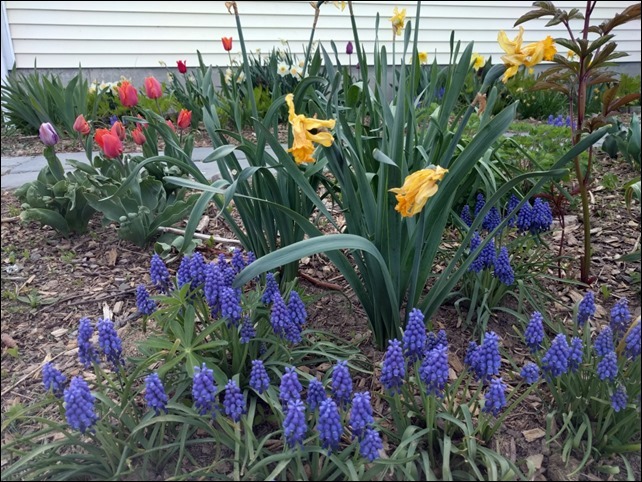 Turned out we had been planting too late for New England. Cleared an overgrown patch of original landscaping from the front yard and re-contoured the whole front yard, including the drainage ditch. Rebuilt the main culvert near our house, put in a small duck pond and widened the drive over the culvert. Reshaped the driveway and added new stone/gravel. Put up a Gorilla playset for the kids. 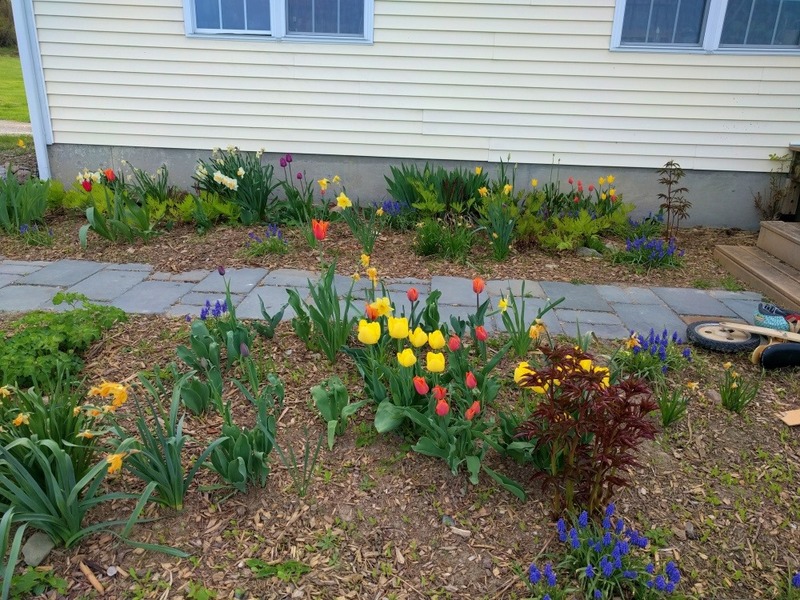 Start working on the “drift” landscaping ideas in the front yard. These are wide swaths of perennial plants and grasses in mostly organic shapes following the contour of the land. Expand the windbreak and begin preparing for a more extensive hedgerow or permaculture mixed species planting on the north edge of the property. 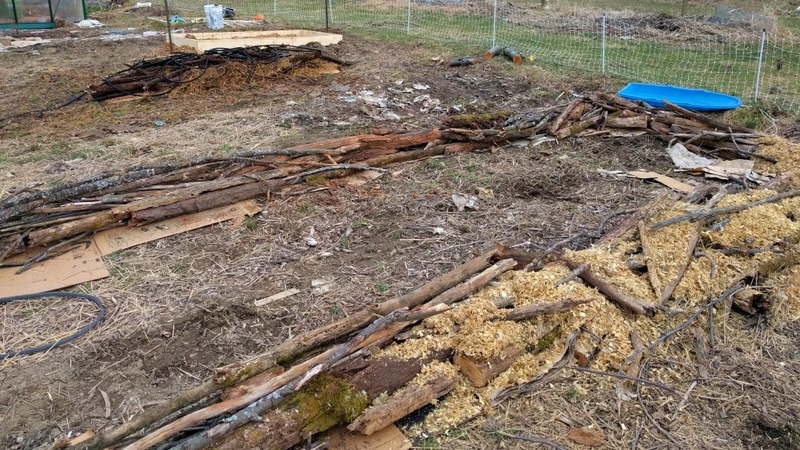 We are working with a permaculture specialist on a plan for this. At least begin the planning stages for fencing in the front pasture. Tear down our existing rear deck and rebuild a new one. Soon it will be time to buy and start seeds. By the way, if you are thinking about seeds, don’t forget about my site PickAPacket.com and tell your friends. It allows you to compare prices and see varieties carried by my favorite non-GMO seed companies, including lots of heirloom, organic and open-pollinated varieties. On Friday I worked with our tree guy again and got some more trees planted in the start of our windbreak. These are a mix of Arbor Day trees he planted on his property 8 or so years ago and some Norway Spruces from a local nursery. By the way, when Arbor Day suggests planting seedlings for a few years and then transplanting them, a few years is best. Not eight years. Not a fun job digging those up and transplanting them. But hoping they survive because they are nice trees. We hope to keep extending this windbreak area and probably will add some additional diversity such as deciduous trees, small fruiting bushes such as service berry or bush cherry and so on. We are also thinking of eventually putting in a diverse hedgerow/windbreak along the entire north/north-east border of our property that might include additional fruit and nut trees, but still trying to figure that out. I thought it would be fun to start a short little series of before and after shots of various parts of our property. Unfortunately, I don’t have good before shots for everything. But I have some cool ones to compare. 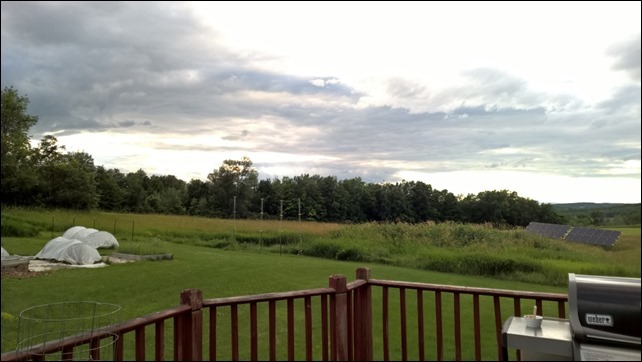 Here is the first one, a shot from our back deck looking back over the northwest corner of our property. Not the most interesting one, but some cool things happening never the less. 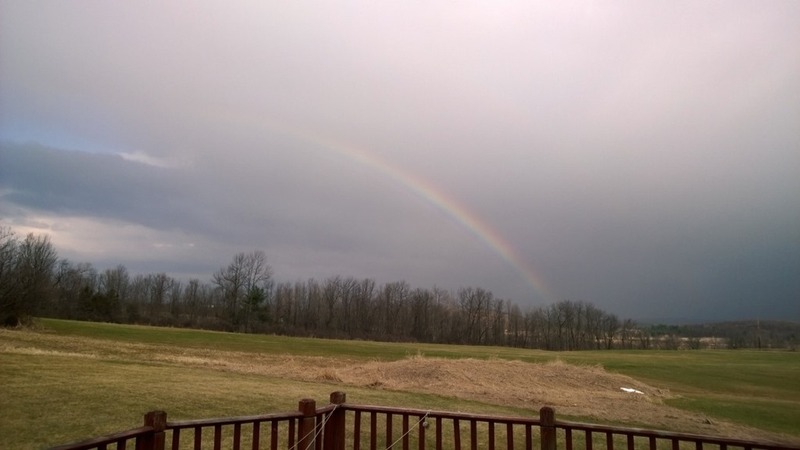 The before shot does have a cool rainbow going for it. Here is the after shot, taken yesterday. 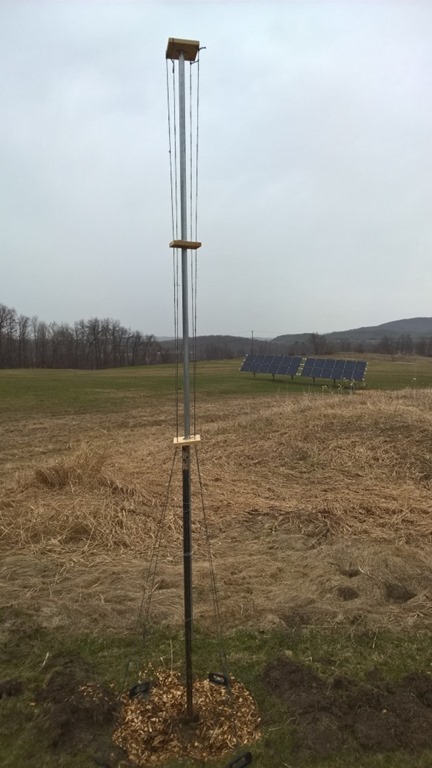 Biggest impact change is the solar panels of course. 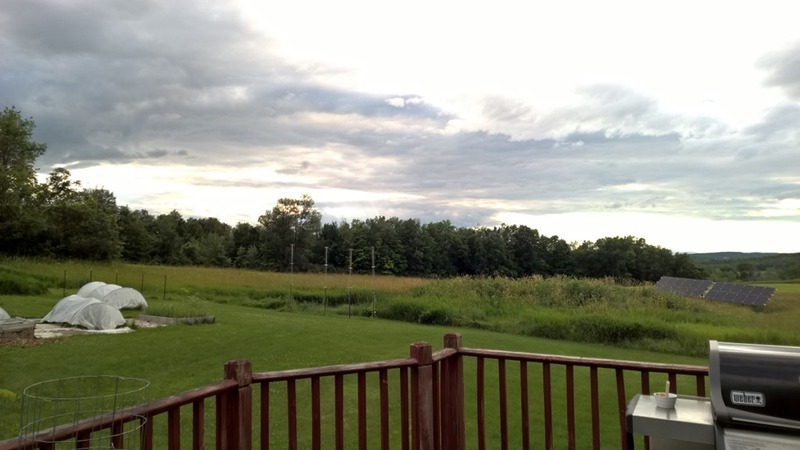 You can also see some hop poles along the edge of the yard. 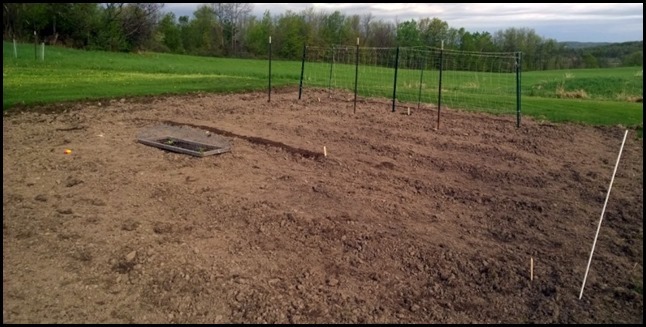 The t-posts in the back corner are where the raspberries are planted. 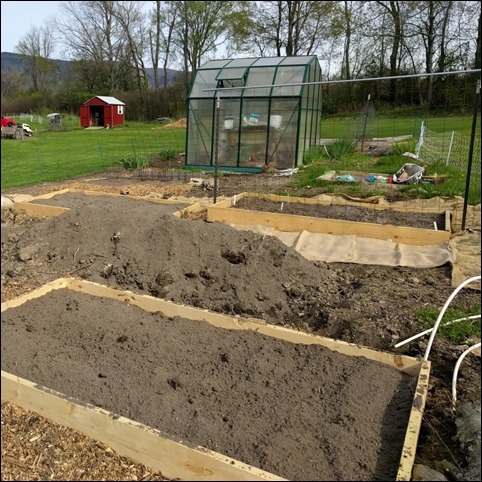 We moved our raised beds over to this side of the garden and added a few. Btw, the gas grill is relatively new too. After many years of being a charcoal only purist, I finally gave in to the convenience that is a gas grill. Don’t worry, still using charcoal to grill and smoke stuff some of the time. Our property has the opposite problem that California is facing right now, particularly in the spring. We get way too much water flowing over our property from snow melt and other run-off further up the slopes on the south and west sides of the property. At times in the spring we probably have 5-6 distinct streams running across various parts of the property, including right into the driveway. So we are constantly struggling with erosion and washout in our drive and the gardens stay wet for a long time. If we could even get them dried out a week or two earlier, we could get our cool season planting like peas, potatoes and brassicas done much sooner. So part of our landscape design is to build in some swales to help direct the water better. 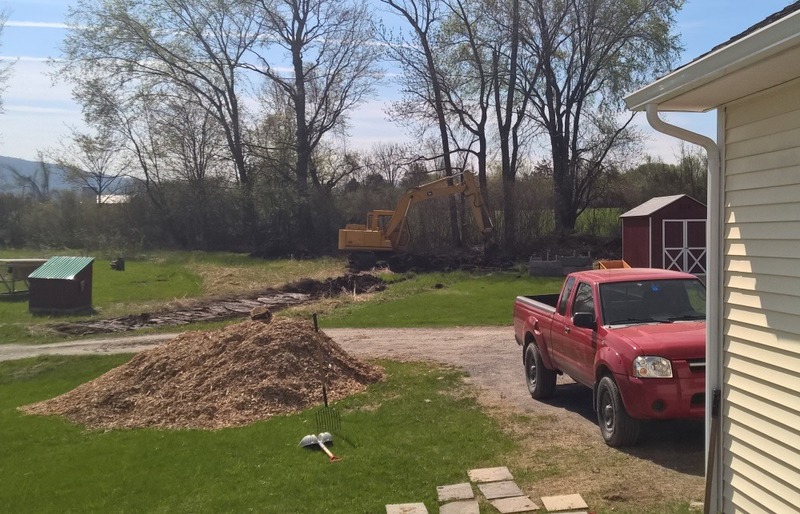 It’s not an insignificant expense and there are other things that would be more fun to spend the money on, but we’re hoping this work will pay dividends for years to come. Today our excavator is starting the work, so excited to see what kind of difference it makes. The main difference won’t be apparent until next spring, but even during big rain storms we sometimes have a limited version of the issues. So it should help with the drainage in general. 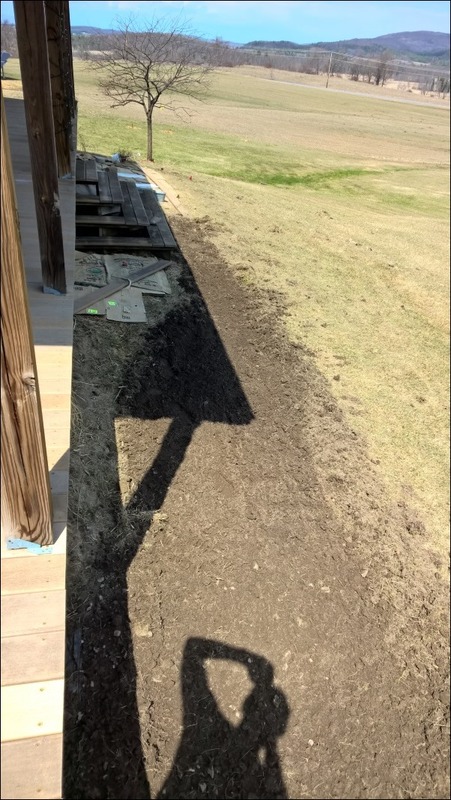 After a fairly nice spring week with temperatures in the 60s much of the time last week, it’s finally getting to the point where some outside work can start. This past weekend was a busy one. One of the items on the agenda for this spring is to do some initial work on the landscape design we had created last summer. 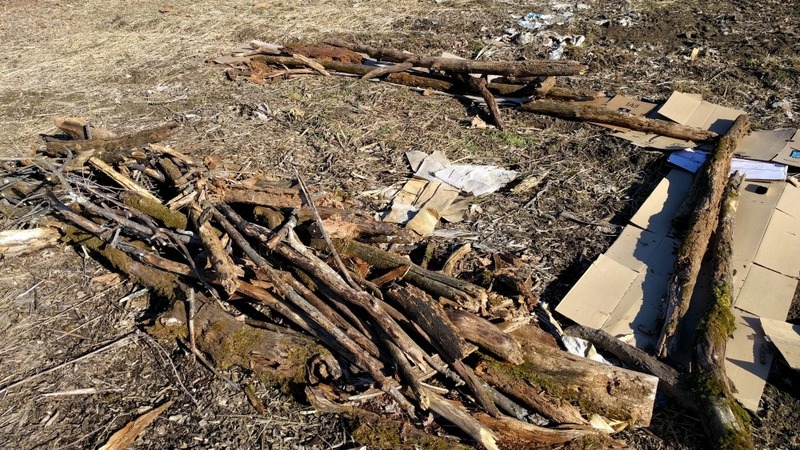 A week or so ago we got a bunch of diseased or badly shaped trees removed from the property. We have a lot of specific trees and spots in the plan, so it will be easier just to start over with exactly what we want. We’re planning to test a few evergreens for our windbreak and may also start planting along the driveway. I also ordered some smaller shade and decorative trees from Arbor Day just to see if I can get any of them to take off. They come very small and will take a long time, but the cost is significantly less than buying 3-4 year old trees. So we’re hoping to do a mix of more established plantings and let some things take a bit longer. 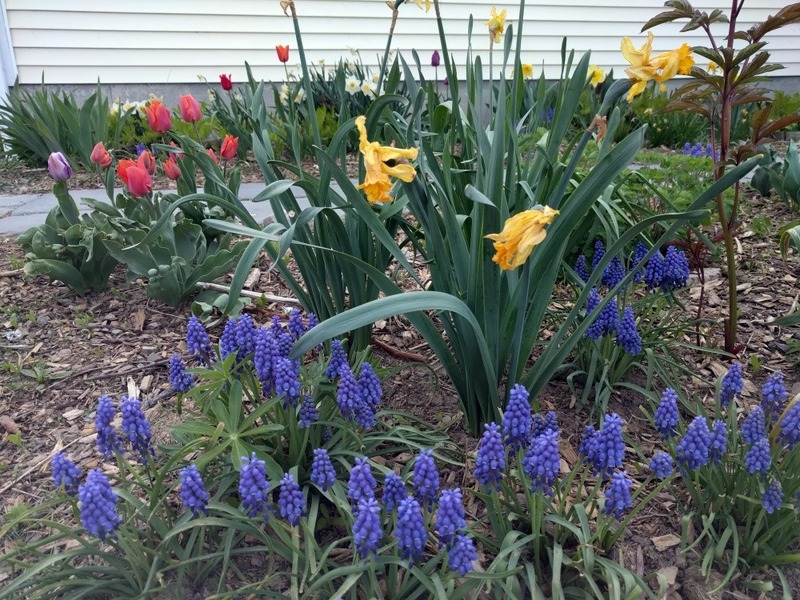 Another spot I am prepping this year is the front of the house. We plan to put up bushes in front of the porch (probably something like Red Twig Dogwood or Miss Kim Lilac). 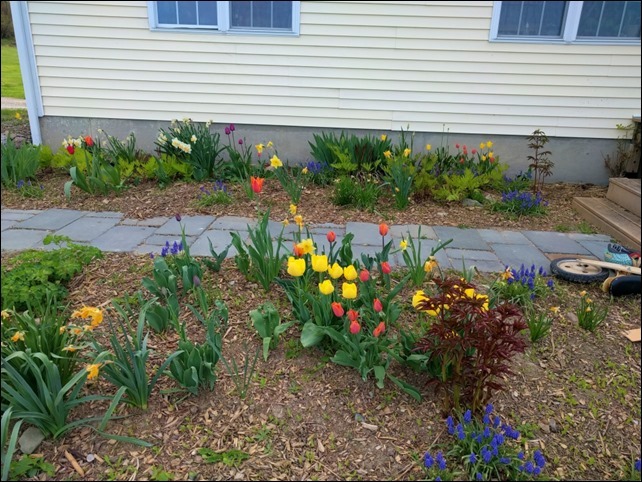 We’re also going to re-do the walkway from the drive to the porch and extend the perennial beds to flank both sides of the walk. I made a good dent in the prep over the weekend and here’s what it looks like so far. Here is the spot for the revised walkway and perennial beds. 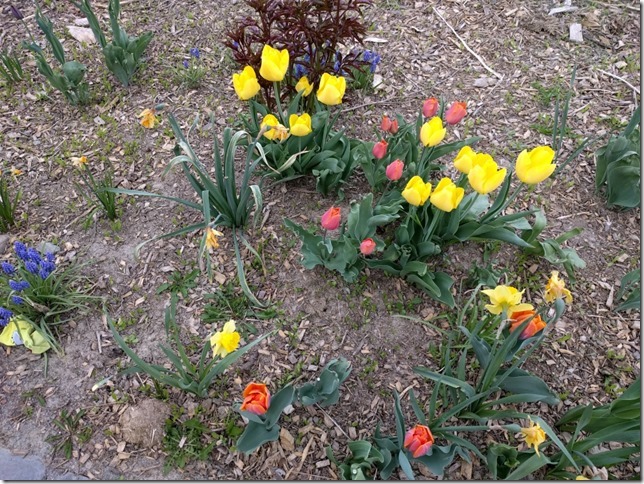 The tulips are already poking up from a smaller bed against the house that we started when we moved here. 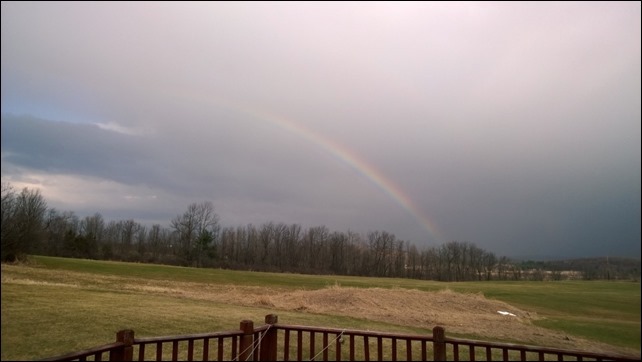 Here is in front of the porch. I’m trying cardboard on one side and using the tiller on the other side. Tiller is faster, but a lot more manual labor. 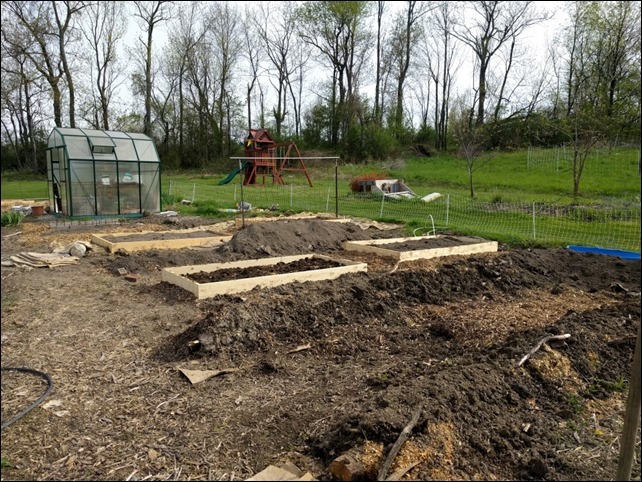 In addition, I’m moving an existing raised bed over to the other side of the garden and attempting to clear a spot for the small greenhouse I bought this spring. Unfortunately the ground is still very mucky and wet, so it’s still too sloppy to use as a base for a structure. Based on how our ground is, I’ll probably have to put down some stone and/or gravel to get a good base. 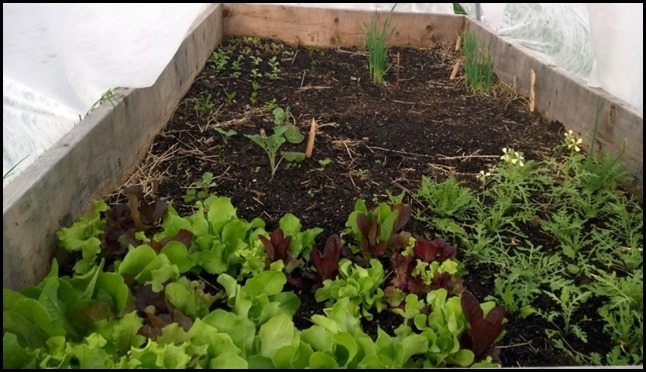 We also continue to get seeds and transplants into the ground, so far just cool weather loving plants like greens, brassicas, etc. The garlic and shallot are poking up above the soil. No asparagus yet and the strawberries are still mulched. Peas are getting sprouted indoors again and Ezra was excited to get to plant some of the snow peas this weekend. 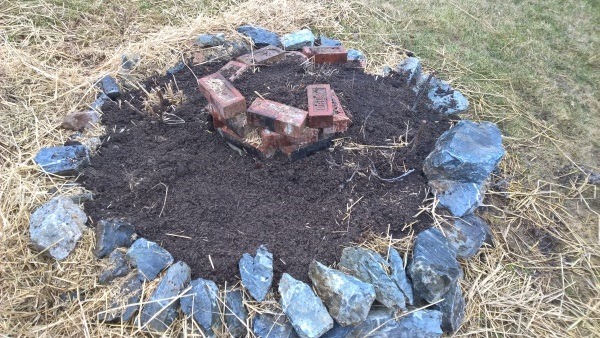 The herb spiral is now cleaned up and fresh soil added. Still not sure if some of the plants survived the winter, such as rosemary, thyme, sage and lavender. Hoping the heavy straw mulch did the trick. 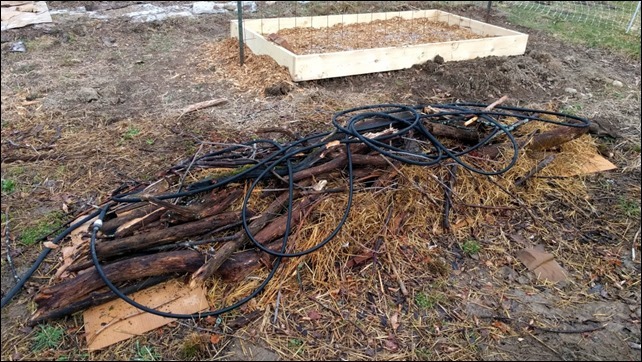 I put together one of the hop poles as outlined in the Planet Whizbang Idea Book for Gardeners by Herrick Kimball. I think it should work pretty well for hops at a backyard gardener level. 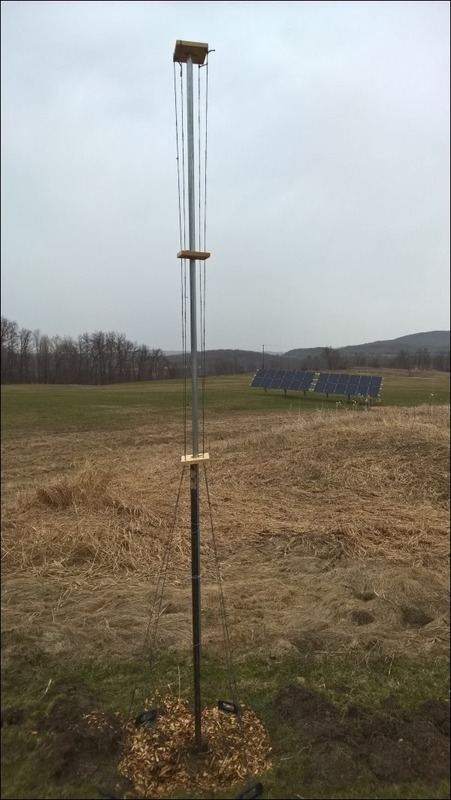 If we ever get more into real hop growing, we’ll need real hop support poles. But this should be fine for now. The front garden is more dry than the back garden, but both are still too wet to plant. I tried to run the tiller on Saturday, but was only able to get a couple of runs in before giving up. It kept clogging up and it’s just not good for either the tiller or the soil when it’s like that. Got a couple of the dryer sections done though, so that will make room for a few things. We still have at least a month here before typical last frost, so no reason to rush. It’s supposed to turn colder again this week, but I imagine the week after that will be busy again as we have apple trees, cherry trees, raspberries and those Arbor Day trees all coming within the next month. We’ve just about got our two garden plots in shape and have started some planting. Took a lot of tilling and it’s still not great. With the clay soil it is either too wet and mucky or it’s dry with hard clay balls. So going to need a lot of amendments, but we knew that. 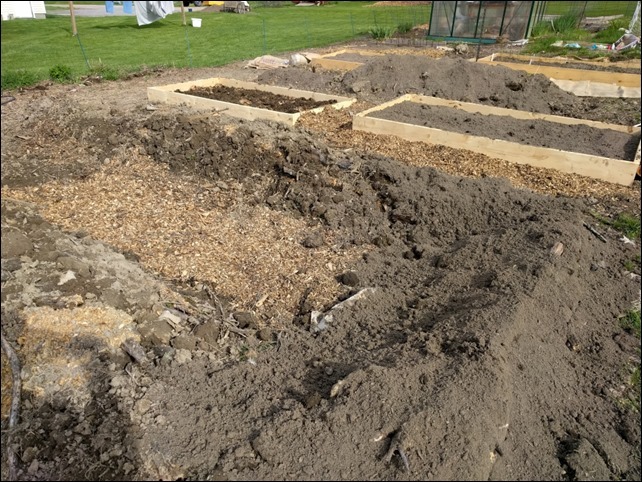 I’m making semi-permanent raised rows, which should help with drainage and give us a place to focus our compost, manure and other nutrients. Here’s a few shots of what we’re starting from. Slightly closer look at the rows. 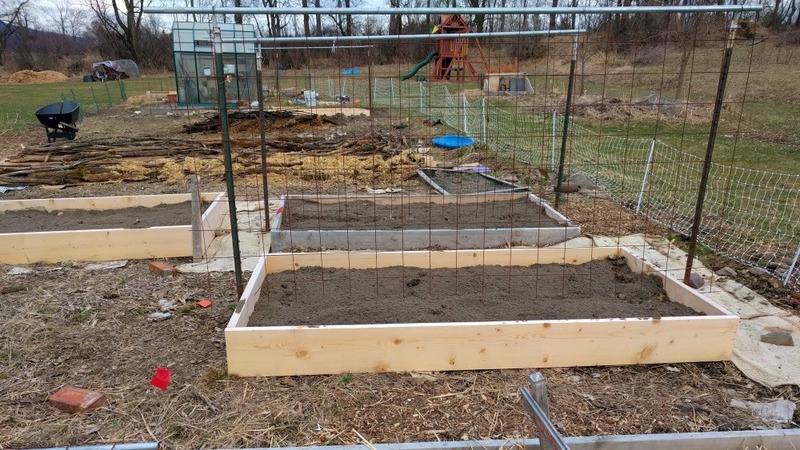 We’ve got three raised beds with row cover going now. It’s been really warm for the last week and plants are suddenly taking off. I had to mow the lawn already. The lettuce seems happy. This is lettuce I started indoors in February or March. 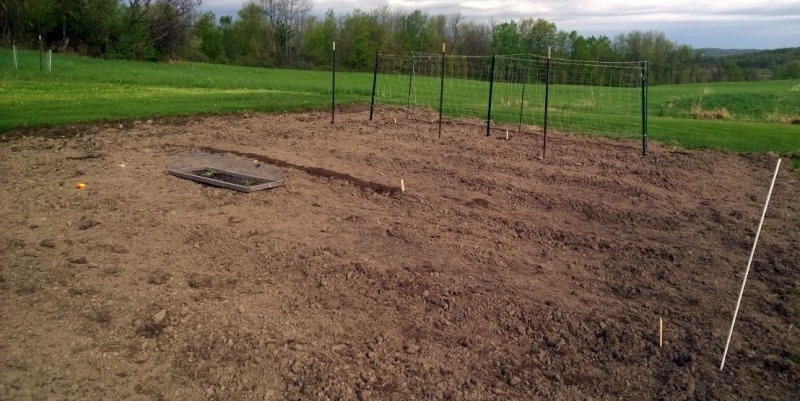 Here is a view of the front garden, which will mostly be perennial berries, asparagus, etc. We’re using it this year for a few other things, like peas, pumpkins and potatoes. And one last shot of some peas that appear to be thriving despite the conditions. As you might expect, life has been pretty busy since our move. Fall went pretty quick and now we are already headed into winter, so work outside will slow down for awhile. Here are a few of the things we’ve been working on. We put in an herb spiral. I’ve always found the idea of these one of the most interesting and accessible permaculture concepts. We have some rocks scattered around the property, so I was able to build this with a combination of repurposed bricks and rocks. We had one little hoop in a raised bed for the fall. 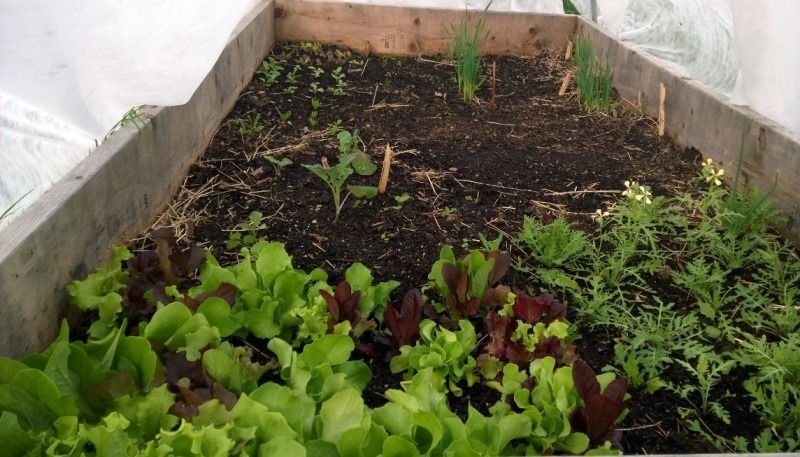 Got quite a bit of lettuce and other greens out of it into November. Also some radishes and Hakurai turnips. The last part of November was fairly cold here, so not much is still growing now. But there are also carrots and bunching onions that should come back and continue to grow in the spring theoretically. 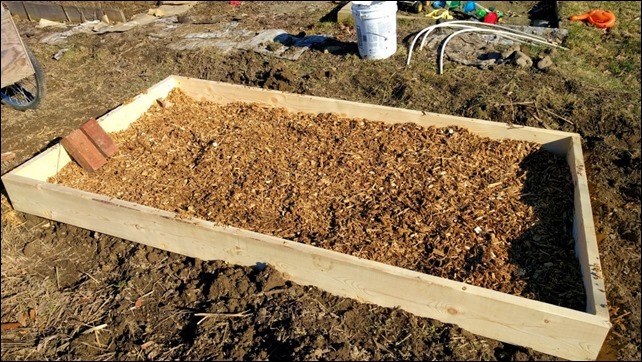 Kristin is experimenting with the concept of a couple of “lasagna” plots, which is basically where you build up a raised bed using various materials (grass, straw/hay, food waste, chicken shavings/manure, spent beer mash, etc.) 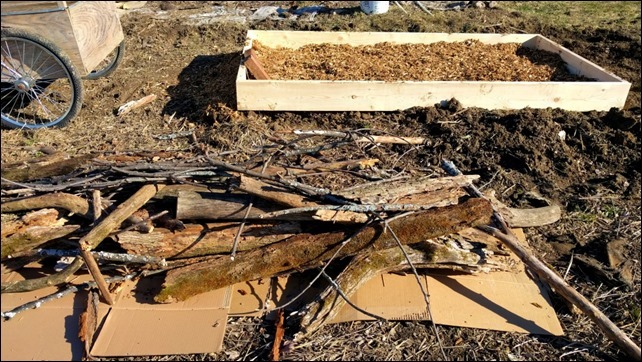 It’s basically building a compost pile, letting it sit over the winter and early spring and then planting directly into it. 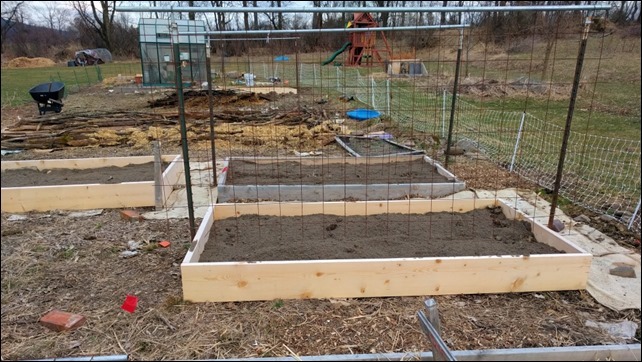 We have two of them going so far, both a standard 4’ x 8’ size that we settled on for raised beds. Makes it easy to use scrap dimensional lumber for frames and the hoops fit over them nicely. 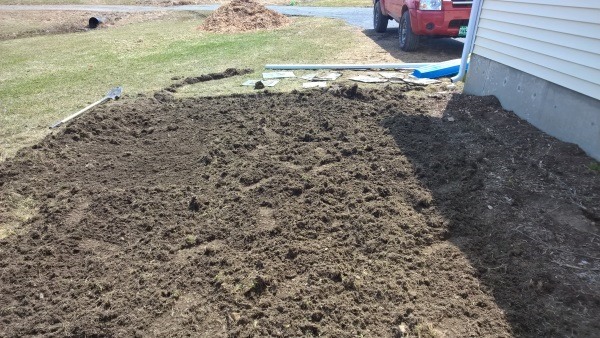 We dug up another section in our back pasture and planted garlic. Our tiller really struggled with getting anywhere with our dense pasture grass sod. It took about 8-10 runs to break the ground into anything useable. So we may need to get some sections of the properly plowed at least once to get certain things started, like asparagus, strawberries, etc. I just planted a couple of hazelnut bushes from the Arbor Day Hazelnut Project. They are developing hybrid bushes that can grow in a much wider range of climates, hopefully over most of the US instead of mainly in a small area of the Pacific Northwest. I also started our windbreak with 10 Norway Spruces from Arbor Day. Eventually I want to build up a substantial windbreak on the north and east sides of the house and along the lane, with a mix of evergreens and deciduous trees. We did a bunch of efficiency work on the house, including blowing cellulose into the attic which was never done for some reason. We also insulated the basement above grade for now as well as our bulkhead door, with the intent of eventually putting foam board on the entire set of walls in the basement. This may not be necessary and foam board is pricey, so we’ll see how it goes. The basement is already noticeably warmer. We would like to eventually put in another heat source, such as a pellet stove. We have a fairly efficient oil furnace, but I don’t like having that as my only option and it’s certainly not the cheapest way to go for a house of this size. This winter I hope to do a few small projects, including building a larger chicken coop using the principles in Fresh Air Poultry Houses. We also still have some odds and ends to wrap up in the master bath, painting to finish in the upstairs and some electrical work to have done. I hope to get some additional storage and a workbench/tool area set up in the basement, now that we have some of the insulating done. 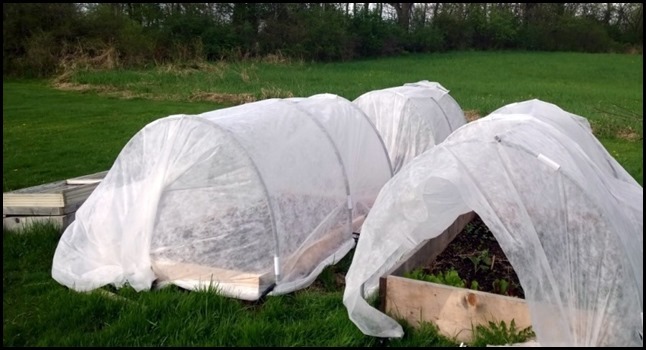 I’ve ordered my first 4 apple trees for spring delivery and we’ll need to start thinking about strawberries, blueberries, asparagus, rhubarb and additional trees for windbreak to plant in the spring. Plus our normal seed starting and the fun we always have looking though all our seed catalogs. 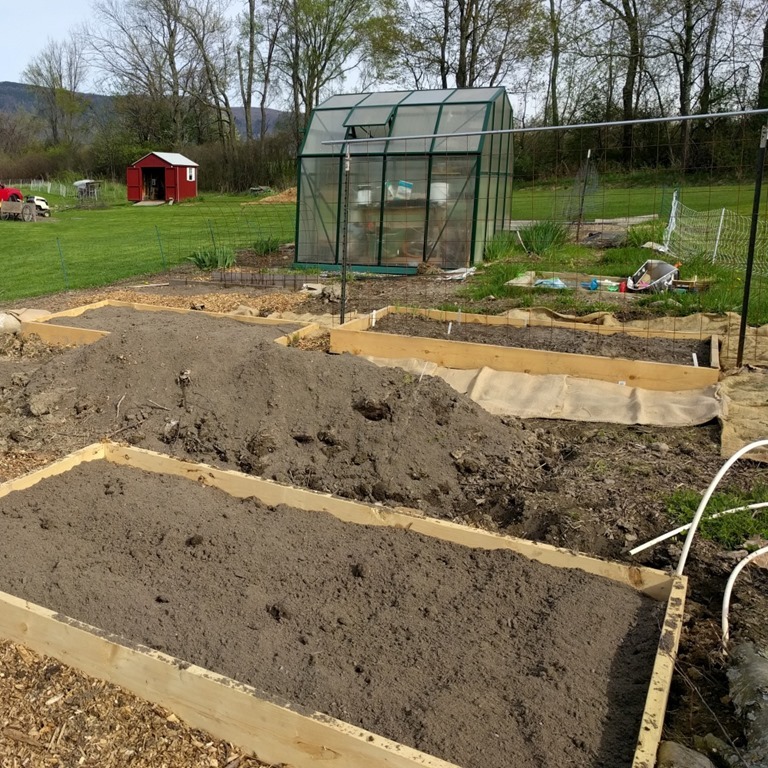 This year we’ll finally be able to grow some things we didn’t have room for in the past, such as sweet corn, melons, pumpkins and lots of other things. Not sure we’ll get to all that in the first year, but we’ll do what we can like we do every year.